Time always flows forward, never backward, and time never stops. It always moves forward. Within time, there is content and events. Time doesn’t just go, there is content and events that are happening. Time also does not move randomly. Time has its own flow towards fulfillment. Time always moves towards fulfillment. It doesn’t just pass by, it always moves towards fulfillment. The philosopher Mircea Eliade said, “How do I understand time? Is time just going around and around for 365 days? Is it just the same January? Is it the same on Sunday? Is it going around and around at the same place? Or is time like a linear line from A to B, just moving along?” He discovered that time is just like a spiral that turns around but it is still moving forward somewhere. Time is still moving around and around, but it doesn’t stay at the same place. It moves toward a certain goal; a certain fulfillment. If time is like that then our life has to move forward as well. Our life cannot just go around and around at the same place. Moving forward means that you are pursuing something. Life that moves forward means you are pursuing something in life. What is sad is not that you have failed to reach your goal. What is sad is that you don’t have a goal to reach, that is what’s sad. Sometimes we fail in fulfilling our dreams and goals, that’s part of life. But the fact that we don’t have a goal to achieve, that is truly sad about life. What kind of life is that? Life without a goal to reach is just like a life on hold, just staying still. We should all have a certain goal to reach. Saint Paul said in verse 14: “I press on towards the goal for the prize of the heavenly call of God in Christ Jesus”. That was Paul’s attitude. He pressed on towards the goal. Paul lived with a clear sense of purpose in his life. To him, life was not just living to him. Life was calling. He came to this world to do this, and he pressed on towards that goal. I wondered what that goal was for Paul so I went back to verse 11, and this was what Paul said: “If somehow I may attain the resurrection from the dead,” that was his goal. He wanted to attain the resurrection. Attaining resurrection was Paul’s goal in life. And I don’t think Paul meant resurrection in a narrow sense of the word, for example, a dead person coming alive. That’s a resurrection, but I think he has a broader sense of the word. To him, the resurrection was not just a dead person coming alive. To Paul the resurrection meant that everything comes alive. 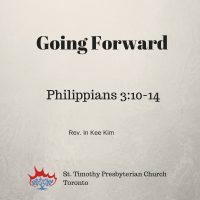 When you look at Paul’s theology, it is mainly focused on resurrection. It was your life coming alive. So you don’t acquire resurrection after you die, you attain resurrection right now in the present time. You can experience the power of resurrection, not when you die, but instead right here, where you are in the present time. Let us look at verse 10. He said: “I want to know Christ and the power of his resurrection”. I want to know now, not later. I want to know the power of his resurrection now. In Paul’s mind, resurrection is what’s happening right now and he wants to know that power. So to Paul, the resurrection was not just a phenomenon of a dead person coming alive, but the power that enlightens our whole existence. When the power of resurrection comes upon us, everything within us comes alive. You come alive. When the power of resurrection comes upon us, every cell of our body comes alive. My rational comes alive. My consciousness is awakened. My soul dances with joy and aliveness. That is the power of resurrection. Only then, when the power of resurrection comes upon us, does our life move forward. We cannot make our lives move forward. When the power of resurrection comes upon us, it pushes us to move forward. When we sail through the storms and challenges of our life by our own strength, we become drained. We become tired and give up. We cannot move forward. I need a power within me that energizes my life to move forward. That’s why I see so many people with dreams and visions when they were younger, but they were disappointed once too often, and they get discouraged and they feel powerless, helpless and hopeless. And then in the middle of their lives, they give up on their dream. I had that dream, but not anymore. They just coast along. Yesterday I had a visitation and a man said “I probably earn 10 times more than you. But I need a dream. I need a vision. I need meaning in life”. That’s what we need. But when we experience so many failures, we give up on our dreams. I’ll just maintain the status quo as long as there’s no problem with it and I’ll be satisfied. I just want to live my life like this until I die. We give up our dreams. They’re satisfied with maintaining the status quo. Do you want to finish your life having your life on hold? No. In my life, I want to do something that of which I want to do. I have to do something that is meaningful. No matter how difficult that may be, it’s what I want to do with the life given to me. I don’t want to just live it. I want to think about what I want to do with my life. I cannot just be satisfied with false satisfaction. This is what Saint Paul said: “Not that I have already obtained this or have already reached the goal, but I press on to make it my own. I press on towards the goal”. If the power of resurrection works in us, we are not fooled by the false satisfaction and the false destination. We have yet to arrive at our destination. We know that an oasis is only a temporary place to enjoy, but that is not our final destination. You have to move forward. You have a journey to take. You can’t just stay there enjoying temporary pleasure and temporary safety. People who prepare for marathons don’t just prepare themselves for the beginning of the marathon or the middle of the marathon. Everybody will be able to run well in the middle, so runners prepare for the last 10-20 minutes and give their whole effort. Olympic swimmers don’t prepare for the game in the middle. Everybody swims well in the middle, but in the last 10th of second, they work so hard. What is your goal? What is your dream? You probably used to have one – did you give up on it now? I don’t even know what my goal is. We need to really think about what we’re living for. For the last journey, we have to give our best effort. What’s done is done, don’t look back. You have a journey ahead of you to take. You have a road ahead of you to walk. Saint Paul said: “Forgetting what lies behind and straining forward. What lies ahead, I press on”. Forget the failures or fear that you have and start fresh from today. Think about what you want to do with your life and pursue that dream, press on towards that goal. If that is a holy dream it will be better, but even if it not a holy dream, whatever it is, set a goal and live towards that. We all have different goals and different callings of life. Please, don’t give up. Don’t get settled down with just maintaining the status quo. Let the power of resurrection work in you. Then you will have courage that the power of resurrection will work in you. The way you see your life will change. You will have energy, vision, passion, excitement, even for the tiniest things. I don’t know how we get that but I believe that this the grace of Jesus Christ. Why do I have passion? Why do I have such a dream and vision? It’s probably because of the grace of Jesus Christ who gave the power of resurrection within us. Even when you’re tired and drained, you feel the power that moves you forward. Having no dream and all that means that you became a victim of fear, that’s why you don’t set up a goal. Be courageous. Stand up again, move forward, and you can do it with God’s power. Not by yourself because you’ll be drained. But with the power of resurrection, you can move forward. That’s what I would like to see in your life.